A simple chronology of Evan’s childhood is impossible. 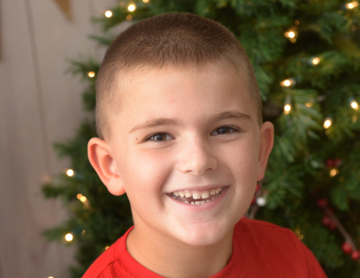 Evan is your typical six-year-old from Nanuet, New York…aside from his diagnoses. Even at his age, he has a medical history longer than any adult I know. 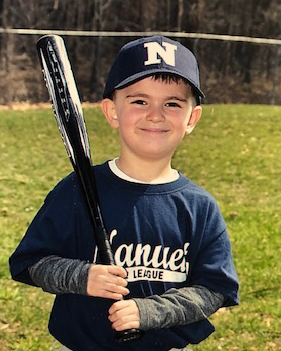 After three different hospital admissions, just before Evan’s second birthday, it was finally determined that his right kidney was functioning at 13%. This was the cause of his elevated blood pressure. Evan’s nephrologist suggested a team at Mount Sinai (NY) to perform his surgery, and we requested a transfer. The doctors ultimately decided to remove his kidney at the age of 21 months. Following discharge, Evan was seen by a long list of specialists and as we learned more, we were able to find doctors who specialized in his diagnoses. Evan was seen by a geneticist at Columbia Presbyterian who determined that he has Ehlers Danlos Type IV and by a vascular specialist at Mount Sinai who diagnosed him with Fibromuscular Dysplasia (conditions which inhibit blood flow to vital organs and connective tissue). Four years later, doctors are reexamining his diagnoses as the genetic mutation he has is similar to these diseases, but one which has not been seen before. Today, we are in touch with a geneticist in Seattle and Evan is part of a research study at Columbia Presbyterian. At this point, Evan has gone 28 months without a hospital admission – the longest he has gone since birth. Evan has 10-12 “routine” doctor appointments per year, and he is a trooper through all of them. 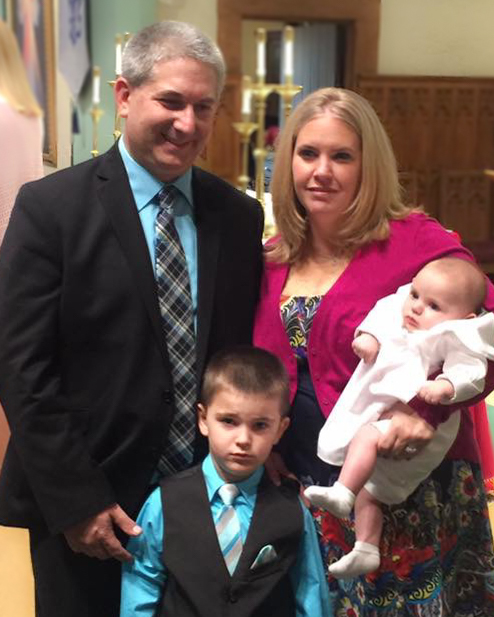 Once Evan had his nephrectomy (kidney removal), he slowly returned back to his “normal” routine. He was your typical preschooler, kindergartener and now first grader. He plays baseball, basketball and soccer. 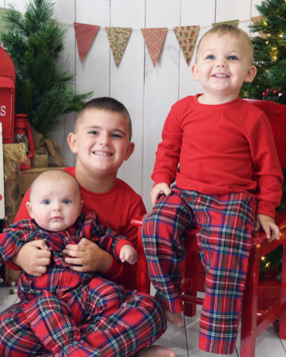 He has two younger brothers, Connor (1 year) and Caden (6 months), who he loves, but they drive him crazy like all younger siblings. The toughness he has developed from his experiences shows; you will rarely see him cry, but he is still just a six-year-old boy. He sleeps with his “Guy”: a little stuffed bear with a blanket attached. “Guy” has seen him through everything – his first day at preschool, surgeries, tests – and he will not go to bed without him. Evan loves Paw Patrol and even named his dog Zuma after one of the puppies on the show. If you ask Evan, the best thing we do is vacation – we go yearly to Aruba. He lets nothing stop him and generally he does not even seem phased by the “boo-boo” on his belly. He knows that he had surgery and that the doctors took his kidney. Only recently has he started to ask what would happen if something goes wrong with his other kidney or if the doctors will ever give the first one back. As a mom, I tell him if something goes wrong with his other kidney, I will get him a new one. And, if you know me, you know that my husband and I will move heaven and earth to find him a kidney should he ever need it. My husband works for Bob’s Discount Furniture, and I am a sixth-grade math teacher. We were both very lucky that we were able to take a leave when Evan was hospitalized. Connor and Caden have also been tested and they have both gotten the all clear from the cardiologist. Evan’s doctors have limited him from participating in contact sports. Right now, he is okay to play soccer and basketball, but as he gets older, the sports will get rougher and he will have to stop playing. Doctors suggested he participate in running as it is a non-contact sport that helps with his blood pressure abnormalities. He started out doing the Rockland Road Runners children’s program in the summer of 2017. He did their two-mile race at the end of the season coming in second from last the first year and last place the second year. When I mentioned these races to my assistant principal, Madelin LoBue (Cresskill, NJ Coordinator), she told me about Healthy Kids Running Series. I signed him up immediately. I would love to say that Evan enjoys running, that he looks forward to it every week. Unfortunately, he sees it as something prescribed to keep him healthy. It is not easy for him, and he does not like it. On top of everything else, he suffers from moderate asthma. Despite everything, Evan is not a quitter. Evan finished every race that he started this fall, coming in last every single week…but, he finished. Even if it meant walking a good chunk of the race, he crossed the finish line running every single week. I say that he finished every race he started because the first week when the volunteers yelled go, he walked off the starting line and came over to me. When I asked why he had not run, he said it was because he knew he would be last. This was the first time I had heard him so defeated, and we had a long talk about how not trying is worse than coming in last. Ultimately, we do not know what the prognosis is for Evan. Some things I read say a life expectancy of mid-40s. Our doctors tell us that he will truly feel the impacts of his diagnoses when he reaches adolescence. Then they remind us that the medical discoveries that could be made between now and then could change everything. It can be hard to process. But then we look at this boy who has overcome so much, and we just focus on the now. Every doctor’s appointment with good news is a win for Evan. Every month we go without a hospital admission is a win for Evan. Evan is a true example of a fighter. He doesn’t quit, he takes his medications without any question and he goes about his day as a “normal” first grader. He knows he was in the hospital, knows he has a scar, but he has no real memory of it. My husband and I just gained a few extra gray hairs. Simply, Evan is stronger and braver than most people I know. While Evan was happy to receive the HKRS Cresskill Healthy Kid Award, it meant so much more to us, his parents. Through everything that Evan must face, we never would have thought we would be able to call him a “healthy kid.” Eventually that award will mean something to him, but right now, it means the world to us. Click on these links find out more about Fibromuscular Dysplasia and Ehlers Danlos and how you can get involved.